"It seemed to be a sort of monster, or symbol representing a monster, of a form which only a diseased fancy could conceive." Starting in 2015, DST introduced Vinimates, a line of Minimates-style 4" vinyl figures. They're a different product category than actual Minimates, because these feature DC characters, and there haven't been DC Minimates in 10 years. Most of the licenses overlap, but clearly not the DC ones, and also not Cthulhu. Like Poe taught us, Cthulhu never really appears in HP Lovecraft's stories - people reference him, they invoke his name, but as far as a physical appearance, we don't even get a proper description of him, just a description of a statue representing him. Thanks to pop cultural osmosis, you know the basics: squid head, wings, all that. The Vinimate delivers. As mentioned, Vinimates share Minimates' body type, meaning a blocky torso and legs, and then more rounded arms. The sculpt even fakes the crotch-block that Minimates have! 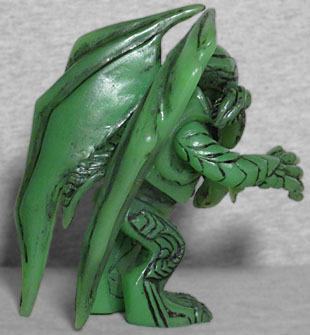 The sculpt is more detailed on the Vinimates line than on its little cousin, so Cthulhu has armor plating that runs along his limbs and covers his torso (though when you look at it, you can really see how easily this could be translated to Minimate form - it already looks like he has a chest cap). The only articulation is a balljointed head, which must be a concession made to keep the Vinimates in the proper product category, but they tend to have dynamic poses; Cthulhu's legs are bentand he seems to be reaching forward, with one claw reaching out. The wings look a little weird, until you realize they're supposed to be folded over themselves: you're looking at the outside of them, not the inside. Shame they couldn't be unfurled, but then they probably wouldn't fit in the box. The normal Cthulhu is available pretty much anywhere, and TRU has an exclusive "Dark Cthulhu" that's done in greyscale, but the best one is the Books-A-Million exclusive, which glows in the dark. At first glance, it appears to be the same green as the normal release, but the packaging insists it glows. 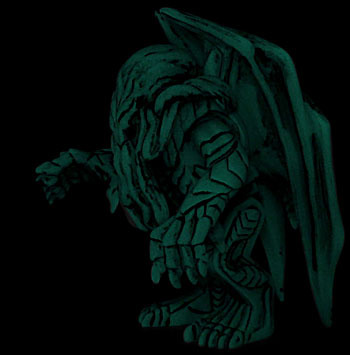 Amusingly, "Call of Cthulhu" (the original story, not the various games that have used the title over the years) describes the statue as being carved from "soapy, greenish-black stone," and the GitD plastic used for this variant really captures that look! It takes a while to really charge the phosphors, but once you do the glow is pretty strong. Whiter than expected, perhaps, but the figure still looks properly spooky! I've passed on the Vinimates line so far, because I didn't want a new scale - I wanted something that would blend with my Minimates. 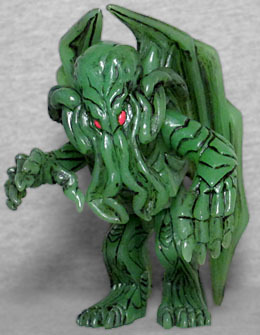 But Cthulhu should be bigger than normal humans, and even the lack of articulation isn't a huge drawback (you can pretend it's a statue in some unholy temple, after all), but it still took the glow-in-the-dark exclusive to get me to take the plunge on him. This entry was posted in Art Asylum, MMMR and tagged Cthulhu, GitD, Minimates. Bookmark the permalink. Yeah, GitD is absolutely the go. We do get a few ViniMate releases over here, so hopefully he'll show up at some point. No Iron Giant for you?